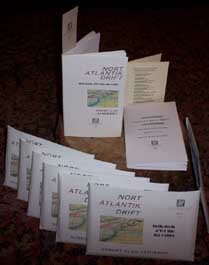 … poets through the ages, in different cultures, making their wee chapbooks. What kind of production values have you, given that the equipment you use is fairly basic, a home PC and printer? Generally, given decent design, paper is everything. Poor paper will make for a poor presentation, while 120 gms will give good results, with no showthrough. Shiny or handmade, there is a huge range to choose from, and part of the fun of making is finding the right paper for that particular printing. But it is pointless pursuing the factory-sheen. While copies should be clean and well presented, the hand-made, or home-made, quality is a virtue. This is an object that has been printed one page at a time, sewn or hand-stapled – may even have a speck of the pamphleteer’s blood where the needle slipped (seriously, those are held back). How does pamphlet publication compare with ‘proper’ book publication, the traditional ‘slim volume’? One thing is that with a collection of poetry which is made en masse – by that I mean the whole print run at once – if there is a typo or an error of some kind, it mars the whole batch. And with poetry there is usually only one batch. But with print-on-demand pamphleteering, the copy is never quite finished, always available for edit. Clearly you won’t get your pamphlet taken quite as seriously as a Faber issue or whatever, but that isn’t the point. You may still find it reviewed in the poetry journals, even so – if the work itself is interesting enough. Are there any obvious advantages to a pamphlet, other than the on-going editing? The best thing about pamphleteering is its immediacy. As soon as the work is ready to be set and designed, you are only a matter of days away from presenting that work to those who you believe should read it, if you choose to push on with the production. No waiting around while a full collection is built, no slow rejection from editors – simply a direct communication of the poetry to the intended audience as quick as you like, in an attractive and pleasant to handle format. It sounds as if you are giving the work away? Of course there is no money in it. That isn’t the point. You might as well say there is no money in poetry. People write it in quantity and exchange it nonetheless. With my own work, at first the copies I made were just to give to friends and fellow poets, but as time went on I sold a few at readings. I never knew what to charge, so I’d tell people to give me what they thought they were worth. If I was business-minded, I might be more firm about selling. But I’m not. So there is no capital return on your investment of materials and time? Again, that isn’t the point. As a poet, I just want people to read what I’ve written and I don’t think them giving me money need be part of the deal, necessarily. The whole point about pamphleteering is that the number circulated is so small it doesn’t really affect anything. If the work was to become part of a full collection later, possessing the pamphlet isn’t likely to put anyone off buying the book. If anything, it works the other way. It creates interest. And what else motivates the activity, besides this desire for advertisement of one’s work? The bottom line is that it is fun to do. I think, for me, it all goes back to being very young, and making little books out of left-over jotters at the end of term, on days when the weather was bad. 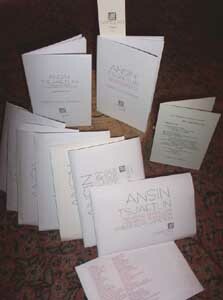 Now, I love those times in my life when I am able to cut loose from other ties and concentrate on making a pamphlet. Usually there are a half dozen attempts while design is perfected, then the painstaking finalizing of text, before the first tentative go at ‘fair copy’. Then the trial run, the establishing of the quickest way to make a copy, and then the making routine of the process, till after a while you are able to do it without too much thought. There’s a real sense of satisfaction about sending the work off to your circle of colleagues and friends. Of delivery. When did you personally first begin to make pamphlets? My own involvement began as I acquired computers and printers, I suppose from around 1988. I was making little sewn-together booklets and cards. As the equipment became more sophisticated, so I was able to make ever ‘fairer’ copies. Having mastered the small scale I tried a couple of longer works, but found my book-making skills were wanting. Now I’m less ambitious, and am enjoying the product more, and am quicker at finding solutions to simpler problems. I’ve done a few pamphlets for other people and would like to do more of that – poets whose work I like, who I believe should be better known. But I don’t want a proper imprint or anything. Small is – if not more beautiful – at least more manageable. Robert Alan Jamieson grew up in Shetland and studied English Literature at the University of Edinburgh as a mature student. 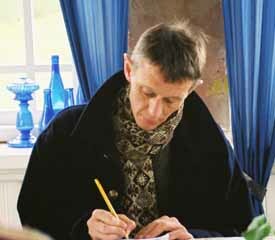 He held the William Soutar Fellowship in Perth 1993-96 and a Creative Writing Fellowship at Glasgow and Strathclyde Universities 1998-2001, co-edited The Edinburgh Review 1993-98, and has tutored creative writing at the University of Edinburgh since 1993. He is now the Course Organiser. His work includes three novels, three collections of poetry, two plays and a libretto for the symphonic cantata Beyond the Far Haaf, which won the Shetland Literary Prize.